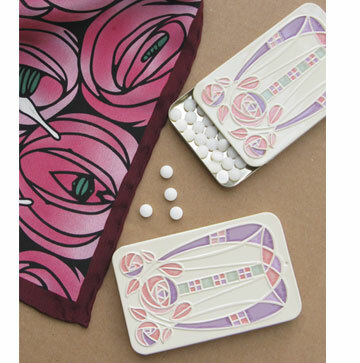 For years we offered our Deco mints, which quickly became one of our most popular items. Some of you asked if we could get a different design tin, so TA DA!!! Here it is, the Charles Rennie Mackintosh tin. The classic Mackintosh rose design gives a softer appearance, but inside you’ll find the same great sugar free mini mints. And it makes a great pill case or business card case when empty. Suitable for pocket or purse. Stock up now.